Students were confined to a university building as armed police swooped to arrest a man on their campus. 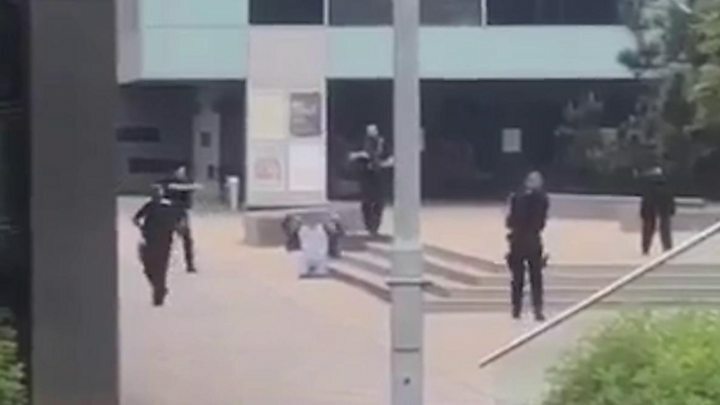 Eyewitnesses described seeing a number of armed officers running to the scene at the University of Lincoln at midday to detain the 25-year-old. Students in the campus library were told to stay inside the building "for a short time", a university spokeswoman said. Lincolnshire Police apologised for "any alarm caused" by the arrest. One student, who only gave her name as Emma, described how she was walking to the library with a friend when she saw 10 police cars. She said she had "never been so scared". "We saw all these armed police and a police dog running about and then these university people in Lincoln uniform told me and my friends to run away." She said a university official "took us into the arts building just for a few minutes" until the area was made safe. On social media, the force said reports of a man being seen with a handgun at the university were "incorrect" and he was not carrying any weapons. Officers from Nottinghamshire Police arrested the man, who was not a student. He is in custody in connection with a burglary in which a man was assaulted with a pickaxe, the force said. The victim was attacked in Norfolk Street, Worksop, at about 21:40 BST on 14 May. He was taken to hospital with head injuries, not thought to be life-threatening, after masked suspects forced their way into his house, police said. It is believed one of the offenders was armed with a shotgun. Lincolnshire Police were granted a warrant to arrest the man at an address in Ruston Way, Lincoln, but he was seen walking through the university campus. A university statement said: "There was a police presence on campus earlier today outside of the library whilst armed officers handled an incident. "We are grateful for the patience and understanding of staff and students."